For one thing, one can never be sure when (or if) the karma train has arrived. The hairball express leaves evidence. If you’re a cat person–and by that, I don’t mean you’re a cat who turned into a person–you know what that evidence is. If you’re not a cat person, it’s better that you don’t know. Cat people notice that when the hairball express stops, it’s more likely to be on a rug or a couch than on a tile or linoleum floor. It often stops at night: this means you step in what it’s left for you. Some people “own” thee cats. This means the hairball express stops more often because the cats get together and set up a schedule so that–basically–the house has full coverage. That means more hairballs in more places at more times, than normal. In this case, less is never more. More is more and when there’s an epidemic, more often becomes the new normal. That is, one expects to find a mess when they first wake up, whenever important company have come by for dinner, or while one is praying that the hairball express will stop at somebody else’s house. The people we have in mind when we create such prayers are those who keep missing the karma train. You know who those people are. They have all the money and/or play hideous music on their car radios at midnight with the windows open. There’s more than enough trailer trash scum whose lives cry out for a visit from either the karma train or the hairball express to make things easy for the fates when they decide who’s gonna get it tonight. I’m writing this post because the hairball express has been stopping by our house 4-5 times every 24 hours. This tells me somebody’s put a hex on my house or my cats. I will find you. And when I do, you’ll probably find a cow patty covered with gravy on your dinner plate after you’ve eaten half of it (the patty, not the plate). Frankly, I think it should be obvious to everyone whether they’re named Frank or something else, that the basic design of cats needs to be tweaked so that there are fewer hairballs. Learning to clean themselves with a sponge rather than a tongue might be a start. Or, perhaps, strong stomach acid that works like Drano so that they don’t swallow a handful of fur and then throw it up on my brand new LL Bean shirt. Bean probably voids my lifetime guarantee on the shirt for such perils as cow patties, meadow muffins, and hairballs. Look, one reason I signed on to be a cat person rather than a dog person is this: dogs have to do their business outside. That means somebody has to come home or wake up to let the dog out. Cats are supposed to do their business in the litter box. But no amount of training seems to get through to them that hairballs belong in the litter box. My wife and I try to set a good example by never throwing up on furniture or pillows or priceless heirlooms. All that is lost on the cats. 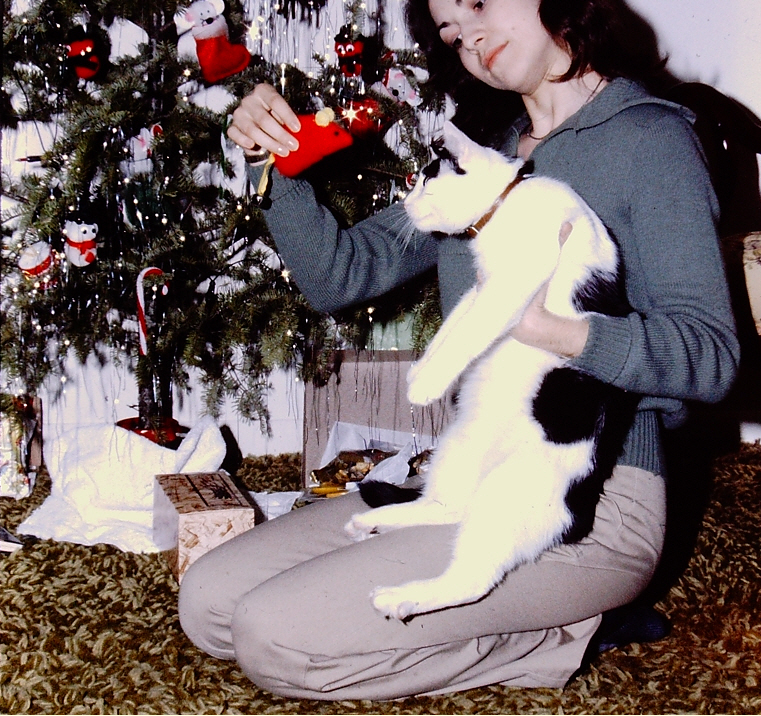 In fact, if you’re a cat person, you already know that–except for expediency–everything is lost on cats. Malcolm R. Campbell promises you that when you read “Conjure Woman’s Cat,” you won’t find any hairballs in the story. When I was a kid, I read The Hound of the Baskervilles and immediately became a “dog person.” I imagined becoming a famous writer who would live on an immense estate protected by supernatural and potentially unfriendly deer hounds. My fiancée informed me I was going to become a “cat person.” Other than the expedient fact that she was a cat person, the practicalities of the matter were that large hounds don’t fit well in apartments. They need, if not moors, large yards. So, about 30 years ago Needles became our cat because (a) a friend’s cat had a litter and the friend didn’t need more cats, and (b) the cat would prove one way or the other if I was “marriage material.” Needles got his name because he had sharp claws and, of all of our cats over the years, his temperament was probably the closest to the hound of the Baskervilles. I could tell stories, but this is a family blog. 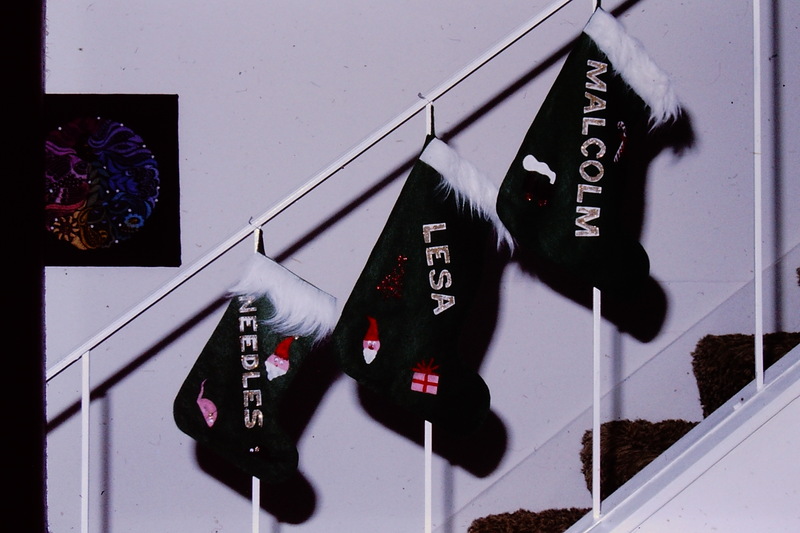 Needles lived a long and adventurous life in Georgia, from Rome to Marietta to Smyrna to Norcross. When he crossed the rainbow bridge he was ancient. His final resting place is the farm where we now live just outside of Rome. My wife likes to tell people that when Needles first arrived in our lives, I had a “what the hell do I do with that thing” kind of attitude. In my defense, I didn’t know nothing about no cats and didn’t know what they wanted or why they randomly freaked out and clawed the hell out of my arms. They’re possessed, I think, by random malevolences that haunt most neighborhoods. Needles liked his blanket. He thought that no matter what infraction he committed (such as grabbing my ankle when I walked through a dark room), he was free and clear if he could just get back to that blanket. It was like home plate or a safe house. We had a deck at the Norcross town home that got so hot on sunny afternoons, we couldn’t walk out there in bare feet. Needles could lie out there for hours. Go figure. By then I had learned that cats sleep 16 hours or more a day and thought (a) what a life, and (b) that at least they couldn’t jump out of dark shadows while they were asleep. 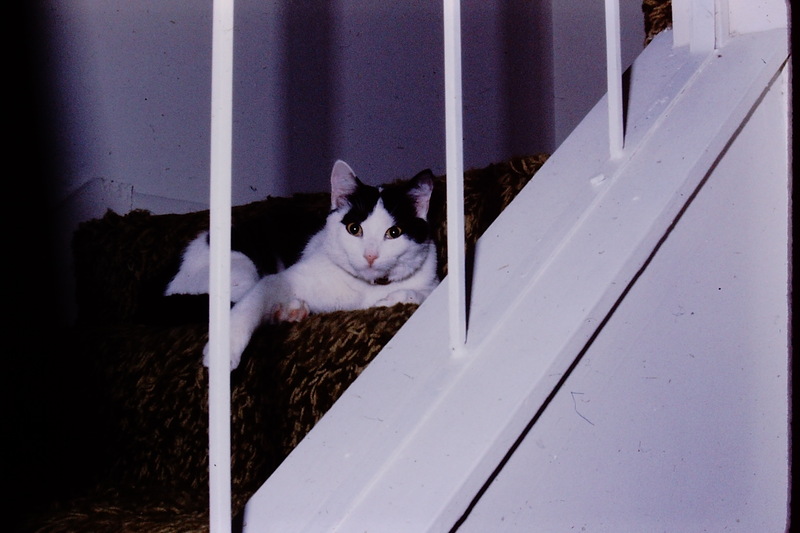 Bottom line, Needles was a hoot and somehow with him I passed the test and my fiancée and I were married in 1987 in a small ceremony in the living room of the friends who gave us our first cat. 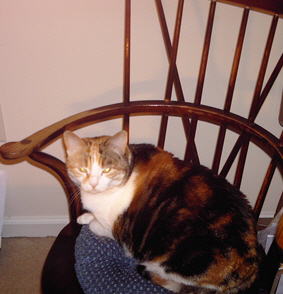 Our large calico cat named Katy is, in her estimation, queen of the household, ruling the other two cats. She spends a lot of the day squeezed in behind me on my large swivel desk chair. A week or so ago, my wife had a roller pan filled with blue paint for a hallway touch-up project. 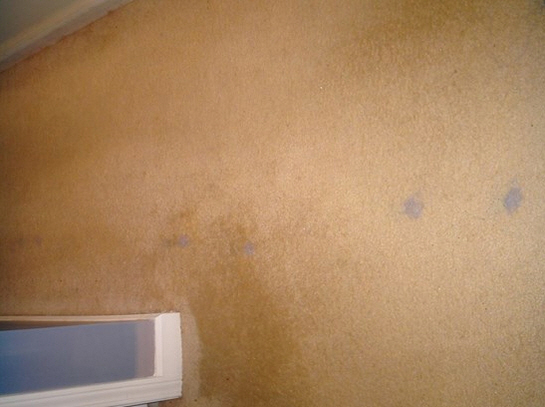 Katy participated in this project by jumping into the paint and then running throughout the house on the light-colored carpet. Clean-up consisted of applying many cleaners, potions, traditional spot removers and elbow grease to the blue cat prints that adorned the hall and living room. The noisier part of clean-up, that included my getting scratched up and listening to howling, consisted of scrubbing the blue paint off her feet in the sink before she licked it off and got sick. She is the hairball queen, but after a little too much throwing up and a refusal to east, we filled her mouth with the gooey anti-hairball product we call gat goop. Katy doesn’t like cat goop and resents people prying open her mouth and putting dollops in there in such a way that she can spit them back out. She did in the dark afterwards behind a rocker after that, always a sign that a cat is either spooked or sick. She was still hiding the next day and turned up her nose at food. I kept checking on her until 3:30 a.m., after which my wife checked on her. A hairball is one thing, a blockage or something acting on her like a poison is another. Can’t ignore that and hope for the best for long. Finally, yesterday, she at a little food again, became responsive instead of zoned out, and sat in my lap while we were watching “Master Chef.” (Anything to do with food or that can be turned into food gets her attention.) Today, she’s squeezed in behind me again in my desk chair. It’s nice to see her back to her old self even though she’s also back to trying to hog food and tell the other two cats (as well as us) what to do. Domestic house cats are like often water, opting for slow and silent pressure rather than overt fire and brimstone approach of other pets when food time is approaching (and possibly forgotten by the two-leggeds in the house). 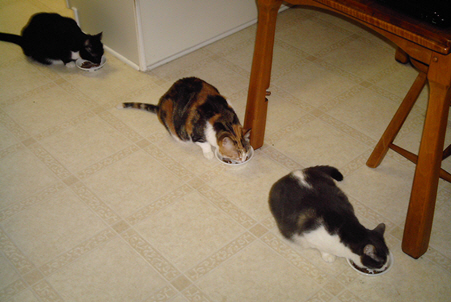 Our three house cats noticeably become more friendly as regular mealtimes approach. They lean against our legs when we walk through the house. They make little murping noises and rub against doorjambs and table legs in our presence. Far be it from me to question why cats don’t have thumbs. If they did, food time for them would probably be 24/7 because (unlike what some cat books say), cats do overeat if the food is available. But since it isn’t, I can set my watch by how close they are to my desk. Since they just got fed 25 minutes ago, they’re nowhere to be seen. Once they have their food, they have no use for me any more until 11 p.m. approaches. Then, I’m suddenly their best friend, the best thing since slice bread, or even a minor god (though not a smart god due to their lack of thumbs). The cats who–as we know–move around on little cat feet like fog know how to use silence to exert pressure. Like the water that slowly erodes rock over time, they erode my concentration over time. I could be in the middle of writing the last line of the great American novel. But I can’t, because I can’t come up with the right words due to the sound of silence all around my desk. Our four cats are convinced that the cruel claw of fate has stuck them with the two stupidest servants on the face of the earth. For one thing, we don’t realize there’s a schedule. If we did, what the hell’s the deal when it’s obviously supper time and we’re not even here. The day’s winding down, and nobody’s in the kitchen. Look at the clock, for goodness sakes. When our cats express their disdain in the strongest possible terms, they become what we lovingly call Halloween Kitties. That is to say, fur fluffed out, eyes wild and heavily dilated, hisses and growls, you’ve probably seen this in cartoons where it was supposed to be funny. Food is another thing. Quite obviously, we’ve got cheese or pot roast or tuna on the counter, and while it sounds like we’re chopping it up into feline-sized pieces, we’re just playing with our food and/or are slower than Christmas. How long can it possible take to cut up a piece of cheese, open the door to the bedroom so something orange and furry can camp out on the bed, or throw a toy across the living room? If cats could sigh, roll their eyes, and shake their heads in order to show their high level of being flabbergasted and put upon, ours would. They have further questions about our sanity when they hear phrases like “the cat’s pajamas,” it’s raining cats and dogs” or “when the cat’s away, the mice will play.” Mice, you clowns have mice? It’s all enough to make sweet kitties caterwaul with despair. But they don’t–for one simple reason. No thumbs. They can’t quite figure out how to work the can opener.